Very cute baptismal kit for your little boy. In beautiful color combinations of coffee and light blue. On the candle they are tied with a fabric brown rope and in a very original way various blue aircraft airplanes. The cloth covering the candle forms a flower. it has a wooden big button in the middle. The set comes with a large fabric bag in beige color combined with a blue striped fabric and a beautiful blue airplane. The set includes: a candle, a large bag, three candles, a soap, a bottle of oil, laurels, underwears and towels. 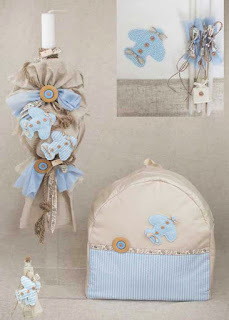 https://www.preciousandpretty.com/2018/07/airplanes-greek-baptism-set-for-boys-E804.html Greek Wedding Favors|Orthodox Crowns|Stefana|Baptism Invitations Airplanes Greek baptism set for boys E804 Greek baptism set for boys, with cute airplanes in coffee and light blue colors. Product #: Greek Wedding Favors|Orthodox Crowns|Stefana|Baptism Invitations_5512138604856156975 5 stars out of 5 reviews.